You may start off wondering what all Aussie Onkaparinga is all about as it's one of those brands that you don't think of normally unless you are in the market for it. Let me tell you Onkaparinga is a Proud Australian company with rich heritage that dates back 1869 and is synonymous with high quality luxury sleep products and accessories. Their growth in recent times have seen them expand to the bathroom and to the beach with their latest and upcoming offerings. I recently had the fortunate opportunity recently to interview the Greg Roberts - Managing Director of the company to find out more about its business and its products. Onkaparinga was established since 1869 – there must be a lot of history. Could you give a brief history of Onkaparinga. What has the growth been like? For generations Onkaparinga was associated with high quality Australian woollen blankets and has established a rich heritage as a well known, trusted brand. [The name Onkaparinga comes] from the indigenous word meaning “The Women’s River” and was referred to as that before reverting to the original name in 1837. The river, at its source at the foot of the Mt. Lofty Ranges, was the site of the Onkaparinga Woollen Mills, first established in 1869. In recent times Onkaparinga has expanded its range to become a leader in the luxury warmth and comfort category... continuing its range extension to beyond the bedroom to the bathroom and beach but always based on a premium premise which allows our consumers to pamper and indulge themselves. What sets Onkaparinga apart from other companies offering similar products eg. Sheridan. What is your differentiation? Our heritage first and foremost sets us apart. It has taken 142 years thus far to build trust and a quality reputation so we are not about to compromise that. Onkaparinga concentrates less on fashion and more on comfort, quality and pampering our customers. Our quilts and bedding ranges are proof of this, as is our new bathroom towel collection and wait until you see our Retro Beach Ware to be launched in David Jones later this year. What’s next on your horizon? What can customers look forward to? We continue to expand our bedding lines, with high end linen to follow soon. In September we launch our beach ware selection, a retro range of beach towels, umbrellas, beach lounges and beach carry bags... We return the fun to beach ware. Look out for it in David Jones this summer. It is difficult to be objective but everyone here is wildly excited with the upcoming release of the Beach Ware range. But, then the current range of our Egyptian Cotton towels is fantastic as well... (Greg couldn't decide on his favourite range and listed a the various ranges he was fond of instead). Would you expand to clothing or accessories? Yes, though within our categories. Sleepwear is one, so too beachwear, such as sun hats, t-shirts and board shorts. Onkaparinga is a brand synonymous with and unique to Australia. So within our category that sits comfortably under this umbrella is the answer with the proviso that it is of premium quality and pampers our customers. Thank you Greg for taking the time out of your busy schedule to answer my questions. 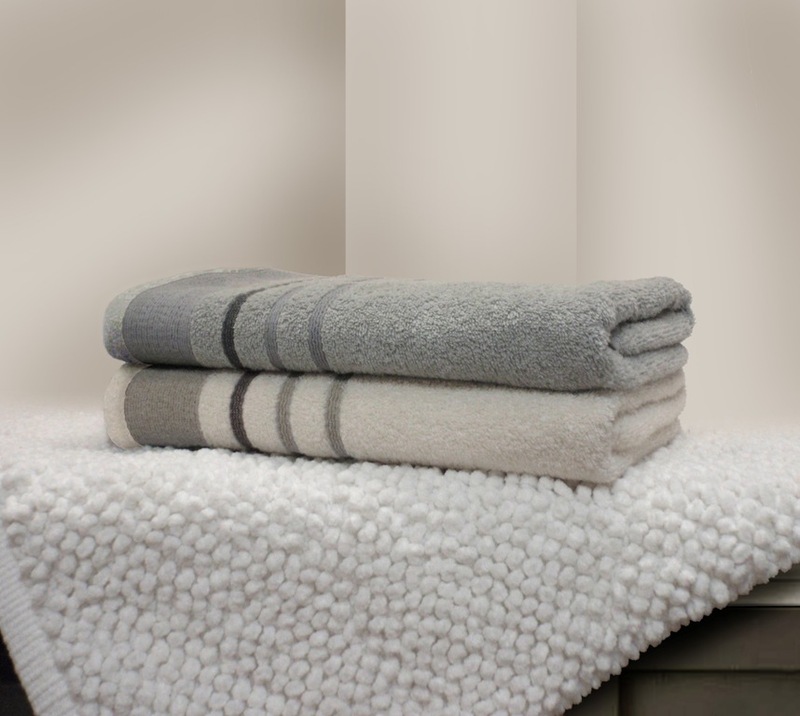 I also had the chance to check out the luxury towel range and I can tell you these towel are hotel quality and stand up to the abuse of daily use and washing and drying and still come out nice and fluffy and soft. I can't think of anything warmer this coming winter than to step out of the shower and onto the soft bamboo bathmat whilst being wrapped up in fluffy soft towels like Onkaparinga's. What's more these towels with their ribbed pattens and sophisticated colour selections (my favourite are the mushroom colours as it's nice and neutral) means there's bound to be one that would suit your decor and add an extra touch of luxury into your bathroom. Onkaparinga Towels start at RRP A$9.95 for face washers to A$64.95 for large bath sheets. For more information on Onkaparinga products or stocklists, please visit Onkaparinga Online. Samples from the latest towel range were provided for consideration.